The Motorola DROID RAZR is one of the newest Android phones from Motorola’s stable and is available exclusively on the Verizon network in the United States. While the DROID RAZR is not radically different from what we have come to expect from Android phones, it is the thinnest smartphone on the market, and packs quite a punch with is combination of the Android Gingerbread OS and a powerhouse processor. This phone is turning heads and motivating consumers to find the out where to buy Motorola Droid Razr for a great bargain! According to Motorola’s adverts, the DROID RAZR is “too powerful to fall into the wrong hands.” After reading the specification list, one would be inclined to believe Motorola’s marketing teaser is actually right on the money. For instance, we have a Texas Instruments sourced 1.2GHz Cortex-A9 processor with 1GB of RAM. That beautiful 4.3-inch display carries 540 x 960 pixls and is Super AMOLED (sorry, no Plus here), and if that wasn’t enough, there is Cornering Gorilla Glass which should eradicate the need for screen protectors with its scratch and glare resistance protection. There is an 8 megapixel camera around back which offers full 1080p @30fps video recording as well as 480p @120fps. The front facing camera is 2MP and will shoot 720p video. Touch focus, geo-tagging, face detection and image stabilization are all included. Other features include quad-band GSM which means roaming outside the United States is possible, LTE as well as a microSD slot for cards of up to 32GB. A 16GB microSD card is included. Overall, the design of the DROID RAZR is one that we admire, and this phone certainly establishes that ‘thin is in’ with its ultra thin profile. Like the DROID X, the top of the back bulges to accommodate the camera as well as antennas. A minor issue, but thankfully, the curved edges make the phone a lot easier to hold over the DROID X. Our only major gripe with the design is that this phone does not have a removable battery. Thankfully, battery life is good, but those looking to carry an extra battery for long road trips might need to consider an option B. As everyone knows, specs do not always transfer intoto real world performance. In the case of the DROID RAZR, Motorola has delivered on the vast majority of its promises. While it still does not best the de facto king of the Android Arena, the Samsung Galaxy S II, it is able to keep up and in our tests it outshined most of the competition. The screen could be a little better, but the vast majority of individuals will not notice the minute discrepancies between the DROID RAZR and displays such as the Galaxy S II. Motorola claims the DROID RAZR can average 8.5 hours of usage on a single charge. In our tests, we averaged between 5-6 hours of heavy usage. For those who are light to moderate users, you will easily be able to make it through an entire day. We will warn you however, carry a charger just in case. Call quality was great and for the vast majority of the calls we made, there was no distortion. Even in areas where signal strength was low, the DROID RAZR was able to hold onto a signal. Suffice to say, you will be hard pressed to find issues with call quality if you are within good to even spotty coverage areas. Unlike the Photon 4G and DROID X2 which have stripped down versions of motoBLUR, the DROID RAZR carries the full experience. If you are looking for a stock Android 2.3 experience, the DROID RAZR is not your answer unless you root it. However, we did not find the animations too distracting. All in all, it is not as great a skin as Sense from HTC, but still very pleasing. When it comes to choosing the DROID RAZR over the competition, the decision really depends on what you are ultimately looking for in a phone. If you can excuse the less than perfect battery life as well as the inability to change the battery, there is not much more you have to give up in order to take the DROID RAZR home. 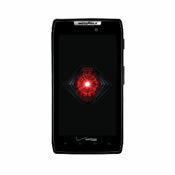 While the price tag at Verizon is a hefty on at $299, select Verizon authorized retailers are offering the Droid Razr starting at only $189. We think that considering to buy the Droid Razr is a wise consideration indeed.